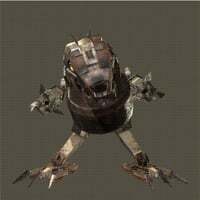 Monster Type is an Standard Machine enemy in NieR: Automata. "Outfitted with extra parts, this reverse-jointed, Goliath-class macine resembles a dinosaur more than ever. It uses energy stored in its dorsal fins to fire lasers from its mouth." Usually have other machines arround, highly suggested to kill them first. While it might be an obvious reference due to the base design, it's fire/laser breath attack is identical to godzilla's atomic breath in the 2016 movie "Shin Godzilla". For those trying to complete their game&apos;s Unit Data an you cannot find itt on your in game list, even though you killed it already, just know it is listed in the Peculiar Machines tab instead of the one the wiki says. I personally thought my game glitched for a few minutes because of that. At least it does for the Xbox One version. can I use him for the machine colosseum? As an FYI I&apos;m pretty sure Monster Type can not be remote controlled or subjugated. for those who missed it in the quest (like I did), don&apos;t worry, chapter select the part where A2 first awakens, go to the forest through the shopping center jump down to the section below where the waterfalls are, if you move in the right place some linked-sphere type/snake-like enemies will come out of the ground, kill them and go to the closest access point and save. load the save and go where the enemies you killed were and the monster type should be there, if not keep loading the same save until it eventually shows up. Good Luck! Can you get this even if you&apos;ve already done Twins Request? I miased thia one aince i already had the items i go back to there with the chapter select and i cant get it to spawn in any help? It spawns after you got the quest "the twins request"! tried going in the forest but never seen it, is there any requirement for it to spawn or it is just rare?